Leaving plants untended – Don’t expect plants to thrive if you neglect them. Plants that turn brown and dry after a week or more probably don’t have a chance of growing properly. If you’re going on vacation, ask a neighbor or a friend to keep an eye on your potatoes. 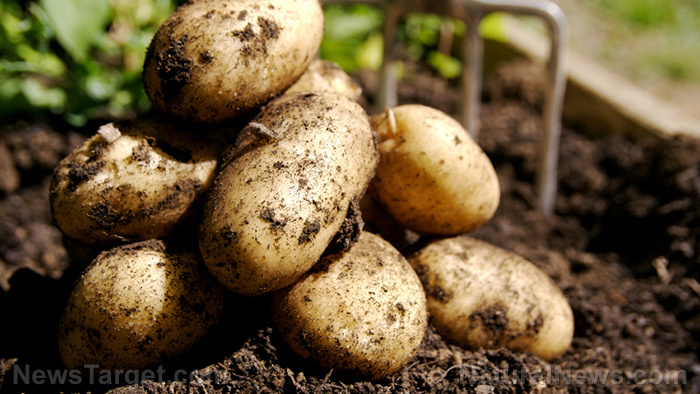 Not using enough soil – Don’t be scared of adding soil around potato stems so new sets of tubers can develop. You can hill every two to four inches of plant growth, but use a measuring stick so you do it accurately. Starting late – Don’t wait until the last minute to plant your seed potatoes. Potatoes grow best when planted at 40 degrees F in a cooler climate. In a warmer climate, you should start planting around March, with a temperature of about 60 to 65 degrees F at night. When possible, delay the planting until late summer so you can sow potatoes in the fall. Using generic seeds – Don’t buy generic seed potatoes if you want to harvest lots of potatoes. Consult other homesteaders to find out what can thrive in your region, noted Grimme. You can also visit the local gardening store for high-quality seeds. If you’re using vertical growing for your potatoes, consider tall mid- to late-season varieties with heavy sets. Hilling or mounding plants means forming mounds around the base of a plant. Hilling can be done via mounds for individual plants or in rows. To hill or mound individual plants, take several shovels of rich garden soil. Form a mound at least three to six inches high. Bury a lot of compost and well-rotted manure beneath the mound. Let the soil warm up a bit then start planting seed potatoes. To hill rows, shovel three to six inches of soil in the length of the row that you’re hilling. Use a rake to smoothen the row. Use a hoe to dig furrows and plant seed potatoes. Hilling is good for potatoes because the elevated soil warms quicker than the rest of the garden soil. Using this technique, more soil is exposed to air and sunlight, allowing you to start your planting season earlier. In the fall, hilling can even give you extra days of gardening. Hilling also draws excess moisture from seeds and plants. Since hilled soil or raised bed soil is less compacted, it makes air pockets and nutrients more accessible to your plants. Looser soil lets plants spread more easily, allowing for a larger and healthier root system. You can read more articles with tips on how to grow potatoes and other vegetables at Homesteading.news.